Since most people use online social networks like Facebook to keep in touch with people who they interact with in real life, it doesn't make sense to sign up for a Facebook account unless others in your area have already. This predicts that we should see a spreading out of Facebook from its founding location, just like a contagious disease rolling out from Typhoid Mary's neighborhood. Let's take a look at the data and see. Unfortunately, these are not per capita rates. But you can still tell that the Northeast has a whole hell of a lot of activity, while super-populated California shows little. Luckily, Facebook calculated the number of adult users in each state, and divided this by the state's entire adult population size to get the prevalence of Facebook among adults by state. The data are here, and I've made a bubble map of them here. Note that the pattern is pretty similar, even though these are now per capita rates. 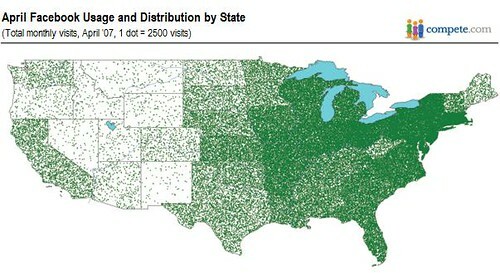 Close to Harvard, prevalence is high, and it declines pretty steadily as you branch out from there. 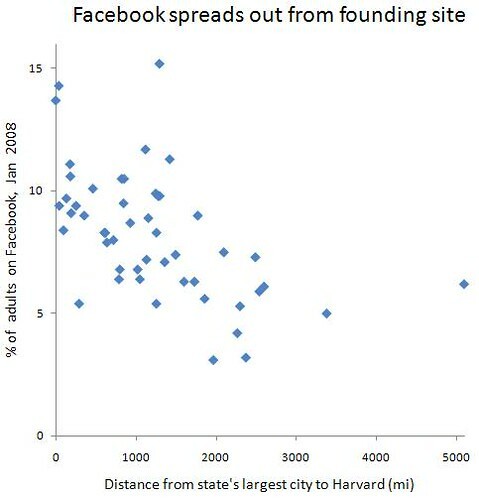 The Spearman rank correlation between Facebook prevalence and distance from Harvard is -0.58 (p less than 10^-6). If Facebook were being used to talk anonymously to a bunch of strangers, as with the early AOL chatrooms, then the adoption of this technology wouldn't show such a strong geographical pattern -- who cares if no one else in your state uses a chatroom, as long as there are enough people in total? This shows how firmly grounded in people's real lives their use of Facebook is; otherwise it would not spread in a more or less person-to-person fashion from its founding location. It's not that there aren't still chatrooms -- it's just that, to normal people, they're gay, at least compared to Facebook. Few would prefer joining a cyberworld for their social interaction -- using the internet to slightly enhance what they've already got going in real life is exciting enough. The only exceptions are cases where you have no place to congregate in real life with your partners, such as a group of young guys who want to play video games. Arcades started to vanish around 1988, so that now they must plug in to the internet and play each other online. For the most part, though, the internet isn't going to radically change how we conduct our social lives.